Bernanke: Tapering QE3 plan not a "preset course"
Bernanke: Tapering plan not a "preset course"
The Federal Reserve plans to start slowing its controversial bond-buying program later this year and end it completely in mid-2014, Ben Bernanke told lawmakers Wednesday. However, that scenario is certainly not set in stone. It depends entirely on how the economy progresses, he said. "I emphasize that, because our asset purchases depend on economic and financial developments, they are by no means on a preset course," Bernanke said. The Federal Reserve Chairman testified before the House Committee on Financial Services, and his prepared remarks, which were released early, largely repeated comments he made at a news conference last month. The economy is growing at a "moderate pace," in spite of "strong headwinds" created by federal budget cuts, Bernanke said. He pointed to recent improvement in the housing sector and labor market, but also stressed that "the jobs situation is far from satisfactory." Meanwhile, federal budget cuts remain a risk to the economy, he said. "My suggestion to Congress is to consider possibilities that involve somewhat less restraint in the near term, and more action to ensure we are on a sustainable path in the long run," Bernanke said. As of June, the unemployment rate was 7.6%, and Fed officials expect it to fall to around 7.25% by the end of the year. Meanwhile, inflation has remained below the Fed's target of 2% per year. Against that backdrop, Fed officials remain optimistic that the job market will continue to improve gradually. If the economy lives up to their expectations, Bernanke says the Fed will start to reduce its asset-purchase program -- called quantitative easing, or QE3 -- later this year. That policy, which launched last September, entails purchasing $85 billion in Treasuries and mortgage-backed securities each month, in an effort to reduce long-term interest rates. As Bernanke has said previously, the Fed could start to slow QE3 later this year, and end it completely in mid-2014, provided the unemployment rate falls to around 7% and inflation nears 2% over that time frame. But the plan could change if the economy does not follow that course. Bernanke even noted that, should the economy weaken, the Fed stands ready to increase QE3 purchases. "Indeed, if needed, the Committee would be prepared to employ all of its tools, including an increase [in] the pace of purchases for a time, to promote a return to maximum employment in a context of price stability," he said. 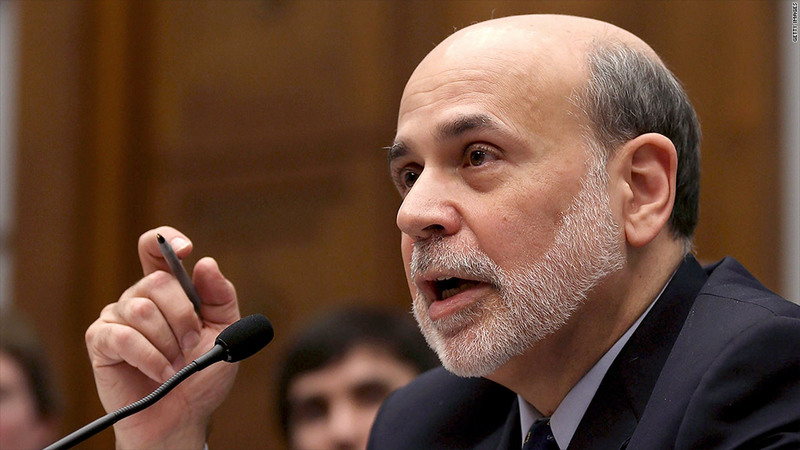 Stocks rose slightly and bond yields fell in the wake of Bernanke's testimony. Overall, financial markets seem to have calmed after a whiplash reaction to Bernanke's last press conference in June. "I think the markets are beginning to understand our message, and the volatility has obviously moderated,"Bernanke said.